Do you like hashbrowns? Me too! And I love them crispy. Don't you? Denny's makes pretty good crispy hashbrowns. And I tried copying them in the past, but the results were kinda gooey and not very appetizing. Luckily, I read somewhere that washing out the starch from the potato is key in making nice, crispy hash browns. It works! Put grated potato in a bowl of salt water. Stir to remove as much starch as possible. This is an important step that allows the hashbrown to be crispy. And if this tip is helpful, please pin. It helps a lot. Drain water using a strainer. Place grated potatoes on a large plate. With paper towel, dry out as much moisture as possible. In a frying pan over medium heat, pour 1 tablespoon olive oil. Add the grated potato in the pan and flatten with spatula. Cook without disturbing the potato until the you see browning on the edges. It will clump and solidify. Carefully flip to brown the other side. This part takes practice. 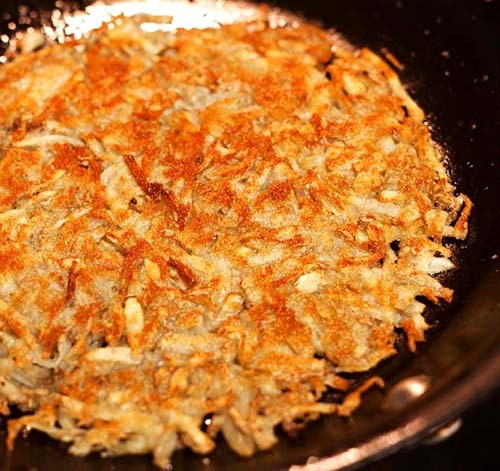 The more you cook hashbrowns, the more you'll be able to flip them over without breaking. If you have a 4-sided boxed grater, you can shred the potato, if preferred. When cooking, using a cast iron skillet is good for even heat and non-stick surface. And lastly, my cousin has an easy time flipping hashbrowns by using a pancake spatula. I love your website. So easy to move about and see things. Not cluttered. Lovely. Love the hash browns, thanks.